Husky launched its HyCAP™ platform in 2009 and it quickly became the industry-leading integrated solution for beverage closure molding. The latest generation features superior engineering advancements, including several new capabilities and features that take machine and mold integration to exciting levels. Combined, these enhancements allow HyCAP™4 to deliver industry-leading performance and productivity, as well as significantly more energy savings. The system is also equipped with intelligent features that make it easier to use, with simplified controls for faster process set-up and improved repeatability. With these advancements, system owners can look to HyCAP™4 to deliver improved returns and increased opportunities. “Husky is committed to reducing our customers’ total cost to produce,” said Gerardo Chiaia, Husky’s President of Global Beverage Packaging. “We do this by focusing our development effort on meaningful innovations that deliver on what the processor needs most. Proven technology maximizes productivity and control. 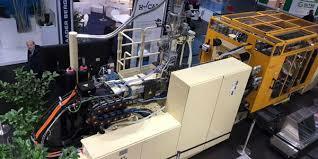 As the industry’s only single source provider of integrated beverage closure injection molding machines , molds, hot runners, temperature controllers, auxiliaries and productivity improvement software, HyCAP™4 has been designed so all components work together seamlessly to provide even higher levels of performance and control, while still delivering the best part quality. The Polaris™ HMI has been redesigned with a 19-inch full color display and more intuitive layout for simplified navigation that provides quick access to vital information and process parameters. Additionally, HyCAP™4 is now available with integrated features to capture contaminants and minimize unplanned downtime. Up to 40% energy savings lowers production costs. A primary goal for HyCAP™4 is to optimize the relationship between productivity and efficiency, while producing the highest quality, lightest weight closures at industry-leading cycle times. Exclusive adjustments have been made to strike the perfect balance between maximizing productivity and achieving industry-leading energy savings. These adjustments include electrification of the clamp motion, servo-variable pumping technology and a regenerative clamp stroke. Combined, these enhancements deliver up to a 40% improvement in energy consumption over the previous generation system, without sacrificing performance. An evolution of the previous generation system, HyCAP™4 offers built-in features that are designed to simplify operation and optimize the molding process. By integrating more intelligence into the system, operators of all skill levels are able to maximize productivity and part consistency. Enhancements include a new part eject assist feature to ensure a consistent freefall of closures at the fastest cycles, and sensor-driven mold alignment to reduce mold wear. Further simplifying start-up and improving ease of use is Husky’s patented intelligent Mold ID technology, which provides information on mold maintenance, process set-up and operation for each start-up. Visit Husky at K 2016 for an exclusive first look at the HyCAP™4 system in action. Husky can be found at Booth A61 in Hall 13. The show runs from October 19-26 in Dusseldorf, Germany.